We stayed at the Villa Maria hotel in Desenzano, which is on Lago Garda, for six days. 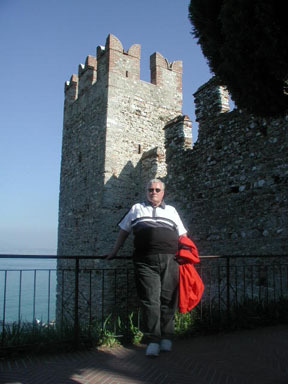 We had a short visit to the vacation town of Sirmione, when we returned from Bassano del Grappa and Vicenza one afternoon. Another day we visited Vittoriale which is near the town of Salo. 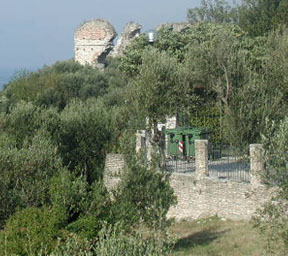 Vittoriale was the home of an Italian poet, and a friend of Musolini. He was the ultimate collector. 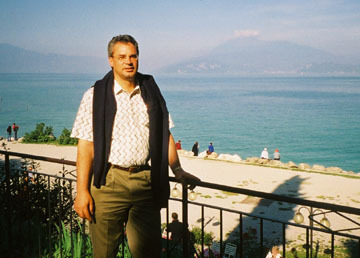 Garay with Lake Garda in the background. I have no pictures of Vittorale. I would like others to send me some to put here.